Posted by Grant Siddall on April 3, 2018 in News, Social Issues, Top Stories. 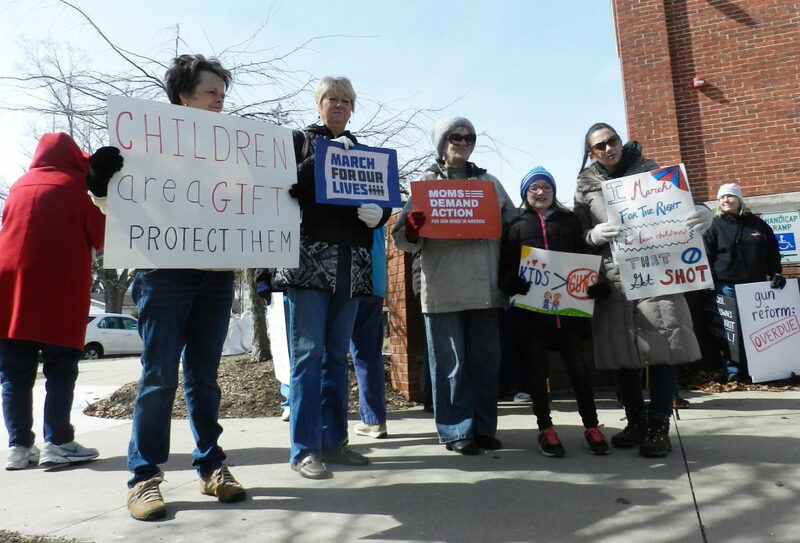 As March for Our Lives took place all over the nation, Mecosta county residents also came out to participate. The event took place Saturday, March 24, and while around the nation the activism was mostly student-led, very few students were present at the satellite march in Big Rapids. Instead, the Big Rapids march was full of parents and grandparents of students; some even brought their small children along. The march started at Big Rapids Community Library and worked its way to Ferris’ campus entrance in front of FLITE, where attendees held signs for traffic to see, spoke about why they were there and participated in some chants. Future Ferris student and march attendee Elizabeth Tatum held a double-sided sign that read “I don’t want to get shot at college” and on the other side it read “I vote too,” which is intended to urge young adults to register to vote who are not yet registered. For many of the people in attendance, the recent school shooting in Parkland, Florida, that killed 17 people was a major reason for them to come to the march. Click here for more from the Torch’s News section.